An apocalyptic M/M Romance. Electricity is gone. Society is on its knees. The heart’s compass becomes the light in the darkness. 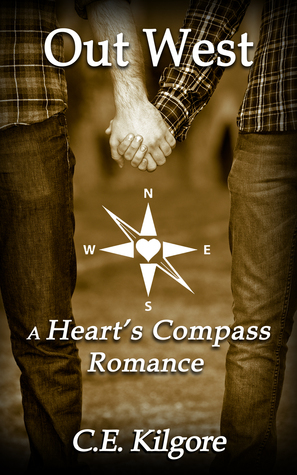 Our heart has its own compass. It knows where we should be heading, even if the rest of us doesn’t. Through loss and love, our heart’s compass guides us through life, often to somewhere completely unexpected. When the world ends, the heart’s compass of several people has them headed in directions they may have never traveled otherwise. Each book in the series is a stand-alone, novella-length story, but is written within the same fictional setting in which the Earth has just been struck with several massive solar flares. All modern technology has been rendered inoperable. Cars, computers, city infrastructure, phones – all gone in an instant and without warning. In the days directly following the end of the modern world, people must learn to depend on each other, and on their heart’s compass, if they hope to survive. Can one scene ruin a book? That’s a tough question, isn’t it? I think maybe it can. I quite enjoyed the first three books, but I can’t say the same for this one. Opening scene, page 3…I’m reading along and ouch, my kindle felt as if it burned me, scorched my fingers to the point that I nearly dropped it. That…that was not cool and I sure as hell didn’t find it funny. Really? I get that we all have our own unique sense of humor but Alex and I do not see eye to eye on the amusement of his little tantrum. Actually, I think his little white lie sucked and it sucked me right out of the story. My first impression was a poor impression and it was lasting. This takes me back to; can a single line destroy any or all of the enjoyment you may have had? The hasty editing was suddenly irritating. The typos glared at me with an evil eye. It was not a fun read for me. I found myself contemplating what I wish I would have spent my three bucks on; an ice cream cone, a gourmet cup of coffee, a small bouquet of wildflowers at the farmers market…pretty much anything but this. Alex is living in Los Angeles when the lights go out on the world and never come back on. His boyfriend walks out on him and he’s left alone in the city. Panic induced madness pushes people to evils they didn’t know they were capable of. Gangs pop up everywhere and violence is knocking at every door. Alex joins the last desperate souls in his apartment building on a risky escape of the city. They are an odd bunch and they band together, seeking a fresh start in a new world. As it turns out, a new neighbor Mateo has been eyeballing Alex and hopes this hike to a safe haven brings them closer together. Nice and close. Alex has suffered a horrific childhood and his poor choice in boyfriends has not made his adult life much better. Could Mateo be the partner that he’s been dreaming of? Or is this Hispanic hottie way out of his league. Frankly, I thought so…but just ignore me, as you can see I’m not in the Alex fan club. I’ll be completely honest here- Go North, South and East, but skip the West part of this road trip…I wish I had. This entry was posted on July 28, 2015 by Sheri in PNR / UF / SF / DYS, Reviewer: Sheri and tagged 2.5 Stars, c-e-kilgore, Dystopian.